Having just travelled six hours from his village in Palpa to Pokhara to take part in a song competition, 22-year-old Toya Biswakarma had every reason to be exhausted. But a smile played on his lips, and he expressed happiness at being given the platform to display his singing talents. Biswakarma, who has been visually challenged since birth, is determined to focus on his singing. 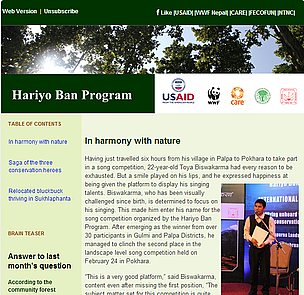 This made him enter his name for the song competition organized by the Hariyo Ban Program. After emerging as the winner from over 30 participants in Gulmi and Palpa Districts, he managed to clinch the second place in the landscape level song competition held on February 24 in Pokhara. With her hands on her lap Nanda Devi Kuwar waits quietly and as her name is announced to recognize her bravery and courage, she walks slowly amid the echo of applause, holding her hands that are still recovering from injury. On International Women's Day, 2013 Hariyo Ban Program recognized three individuals for their remarkable work as change agents in conservation and women’s leadership promotion. They are from the two landscapes where Hariyo Ban Program works - Terai Arc Landscape (TAL) and Chitwan Annapurna Landscape (CHAL). Nanda Devi Kuwar from Kailali was given a special recognition for her bravery, and Durga Gole from Makwanpur and Ek Bahadur Budhathoki Magar from Gorkha were honored as outstanding female and male change agents respectively. Find out about their inspiring struggle and accomplishments. Along with the arrival of spring, there is another reason to rejoice at Hirapur Phanta in Shuklaphanta Wildlife Reserve – the birth of three blackbuck fawns in the last month. The first of the fawns was born on February 9, followed by two others on February 14 and February 17. Three other blackbuck are due to give birth soon. The upcoming two months, March and April, are the peak season for blackbuck births in the wild. According to the community forest development guideline 2065 BS, what proportion of a community forest users committee members should be women? 50% of community forest users committee members should be women. Earth Hour is being celebrated on 23 March 2013 in Pokhara, Nepal. Earth Hour is a global event that brings together communities from across the world to raise awareness about the need to take action on climate change by encouraging households and businesses to turn off lights for one designated hour. Disclaimer: The Hariyo Ban Program is made possible by the generous support of the American people through the United States Agency for International Development (USAID). The contents of this website are the responsibility of WWF and its consortium partners and do not necessarily reflect the views of USAID or the United States Government.